The Ruins of Uzer (formerly Here Be Sand) isn't a very happenin' place. As the name suggests, it consists of ruined buildings and walls, chiseled away by the sands of time. 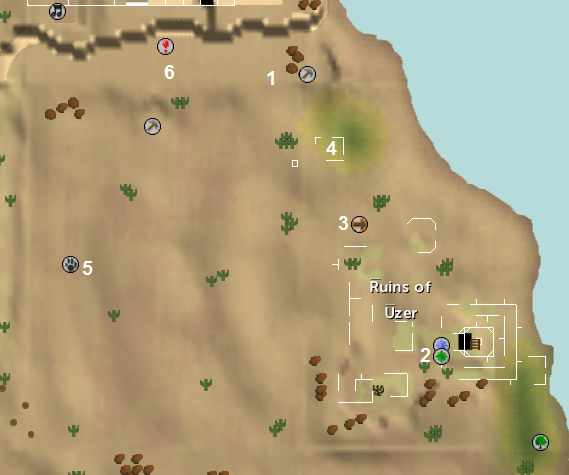 This area caters imgfor some of the items needed in The Golem Quest. As such, there is a small area of clay rocks to the north of the ruins, where you can get some clay. 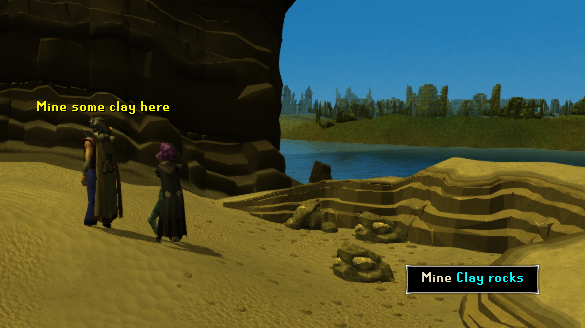 You can find the Desert Phoenix wandering around to the southwest of the mine as well. 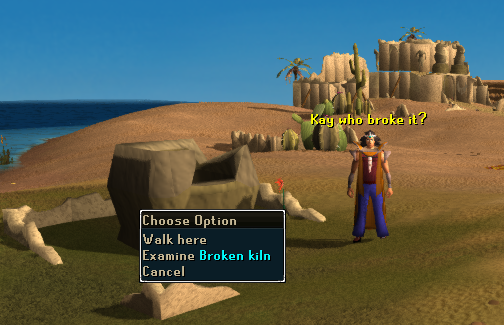 This rare bird is used in The Golem Quest, in which you need to steal a feather from the phoenix by thieving it. 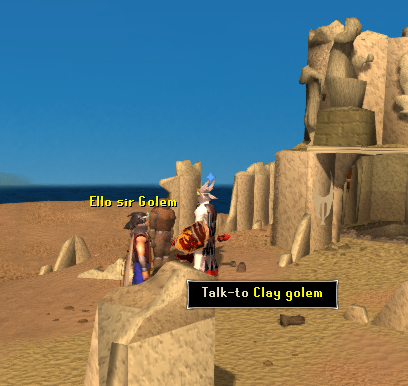 Outside the Temple, you can start The Golem Quest by talking to the Clay Golem. Once you have completed The Golem Quest, you may travel to the Ruins of Uzer from the Shantay Pass. But only once the quest is finished! 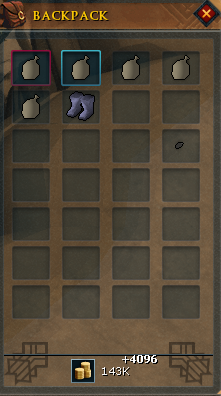 This large Kiln is completely useless, and currently has no use in RuneScape. 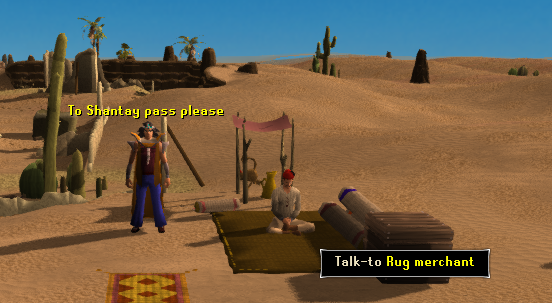 The Desert Hunting area is home to a number of creatures which you can hunt for. 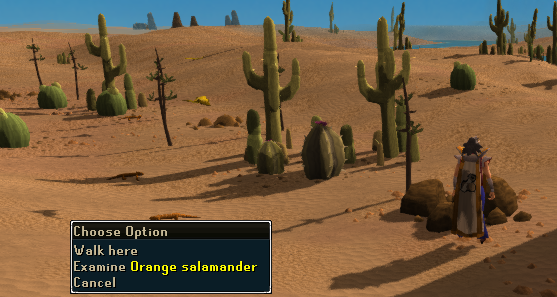 You can use your tracking abilities to hunt for Desert Devils, or you could go net trapping for Orange Salamanders. Located to the west of the clay mine, the Desert Eagle Dungeon is mostly a shortcut for getting to and from the Eagle's Peak Dungeon in the Woodland. Of course, to do this you must first complete the Eagle's Peak Quest. 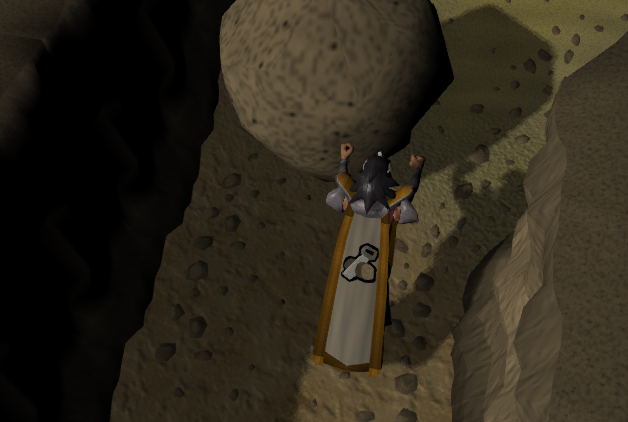 There's also a boulder blocking the entrance of the dungeon, so you will need to enter this dungeon from the desert and push it out of the way first, before being able to use this method. 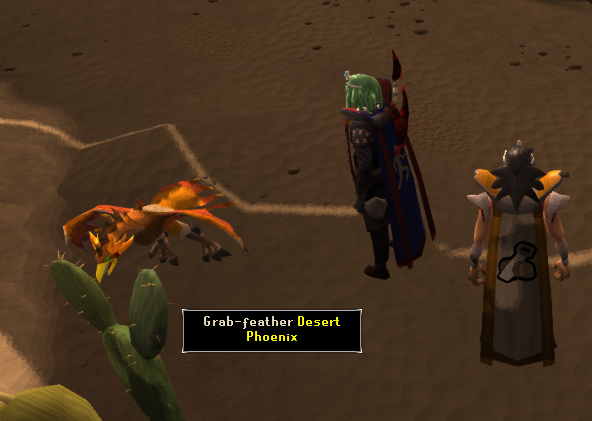 The only other NPC around here (other than the Golem) is the Desert Phoenix.